Very motivated, always looking for new challenges. 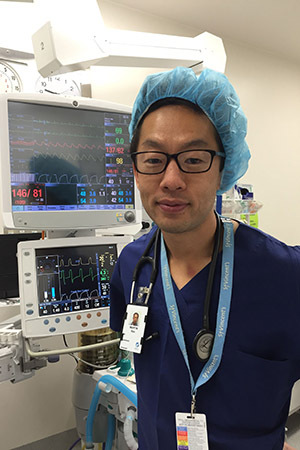 I’ve been a cardiothoracic anaesthetist at Monash Medical Centre for 6 years. Which University of Melbourne ultrasound courses have you completed? How has ultrasound learning made a difference in your clinical practice? My main clinical practice is cardiac anaesthesia – ultrasound has been a true game-changer in every aspect of my specialty. From 2017 we are using the FUSE Vascular course to teach ultrasound sound guided vascular access to junior critical care trainees across the fields of anaesthesia, ICU and ED at Monash Medical Centre. We have found it is such a comprehensive and well put together package and the participants have really appreciated the use of simulators to learn on with the excellent eLearning provided in the course. A long clinical day with lots of lines, echo, ultrasound and emails. Home hopefully in time for kids, reset. What is something about yourself that most of your colleagues wouldn’t know? I collect lots of wine and love Pinot. Your winning formula so far? Very supportive wife and family. What is the best advice you could give? Stand out from the crowd and be special. To find out more about the ultrasound workshops run at Monash Medical Centre, contact us.